Next week’s T-Mobile Tuesday is bringing with it a new piece of T-Mo-branded gear to help keep you warm in the coming months. 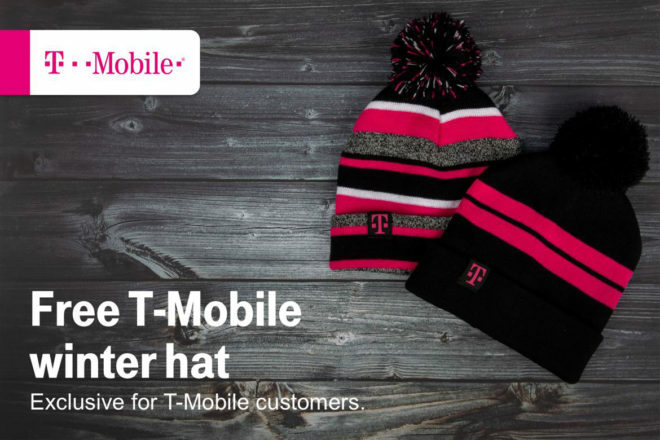 On Tuesday, November 20, T-Mo customers can get a free T-Mobile winter hat with a pom on top. The image shared by T-Mobile shows two diferent versions: one that’s mostly black with a couple of magenta stripes and one that’s covered in black, white, and magenta stripes. Other gifts coming for T-Mobile customers next Tuesday is a free 8-inch Quiznos sub sandwich, a free 1-year ShopRunner membership that’ll get you two-day shipping at a variety of retailers, and $5 off and no fees for a ticket to see the new Robin Hood movie from Atom Tickets. Next week’s prizes will help you get some new Under Armour gear. Four first prize winners will each get a $250 eGift Card for Under Armour, 200 second prize winners will get a $50 eGift Card for Under Armour, and 1,560 third prize winners will each get a $25 eGift Card for Under Armour. Dang…I didn’t even know Quiznos was still around. I love their toasted subs, but all the Quiznos where I live a went out of business. I did a search and found some around, but they’re too far away for make it worth it. Also, for me its too bad that its now $5 off a ticket instead of a $5 ticket (matinee is ~$11-13 with regular times being $13-15). If you have cheaper ticket prices, this $5 makes more sense. There’s only 1 Quiznos within a 60 mile radius from where i live and its only 10 min from me. Score! Hat is going to be strange for warmer climate regions. Not really – people wear beanies in LA a lot. I got mine.. the multi-color striped one. looks cool. Here in South Florida it’s a rare occurrence. Then again we also had a beach bag, a lot of people never see a beach elsewhere so it’s fair. I wish they’d bring back Uber or Lyft credits. no. free pizzas and Vudu credits are fine with me. that usually happens to me. Called in late today so drove by a store as it opened and picked one up. These offers on tmo Tuesdays lately have been crap!